The first TARDIS console prop served three Doctors, however Jon Pertwee was given a prop all of his own, which only lasted a few stories. The following is an account of the incredible number of changes and configurations which the different props went through. Jon Pertwee's first season as the Doctor continued to make use of Sixties Console v1.0 that had served his predecessors but by the end of 1970 it looked dented, chipped and generally dilapidated. A longer-term solution would be needed instead of continual running repairs if the TARDIS was to feature again. In Pertwee's second season no interior TARDIS scenes were required for the first two stories, but the third was Claws of Axos in which the Doctor used his time machine to trap the aliens in a time loop. It was for this story that a replacement prop was finally ordered. The Console Version 2.0 went before the cameras on 22nd January 1971 (pictured left). Despite this console being referred to as a "new" creation attributed to Kenneth Sharp, it was in no way a fresh design and each of the panels deliberately reflected the 60s version of the prop which it replaced. A significant number of components were salvaged from the original prop and arranged in approximately their old layout, and it was also painted the same unusual off-green colour. Other elements of the show which changed down the years had been highlighted and weaved it into the story, but for some reason the console was deemed to be an important constant, and so a deliberate attempt was made to fool the audience into thinking there was no difference. Despite the general mimickery of the layout, there was one main change in the new prop and that was the central column (pictured right). The Version 2.0 column was built from three green tubes in a triangular arrangement, adorned with coloured perspex squares and illuminated by stacked pairs of small flourescent yellow strip lights. The interior had a series of smaller bulbs wired up in a column. The grid below shows how each panel of the original console (top row) was copied onto the new prop for Claws of Axos (bottom row), including the panel with the metal plate which itself had been a new repair on the old prop. Components on the panels that were recycled from the first prop included the two-tone bubble light covers, the cog-grip levers and rows of black switches (all pictured right). 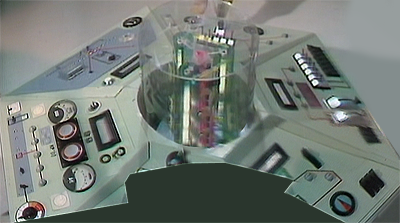 The L-shape levers were reused along with the spinning light discs (which the Third Doctor later calls the Telepathic Circuits). Each panel also retained a speaker grille at the top, although these weren't originals. One of these grilles lifted up and the Doctor removes a component from inside which prevents the TARDIS from dematerialising (seen at the top of the page). For its first outing, an ungainly silver cylinder device was mounted on one panel to act as a power socket. Part three of the Season Nine finale went before the cameras on 9th May 1972 and The Time Monster held a number of surprises. 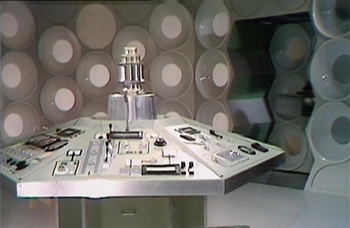 As well as a revamped set of walls, the Master's TARDIS was revealed to have a console identical to the Doctor's but with a central column which consisted in part of an up-turned bucket painted silver, and no transparent column. The Time Monster reveals (or at least confirms) a number of features about TARDISes. They are telepathic, they can communicate, they can materialise inside each other and via an Emergency switch on "Panel Three" (pictured right) they can recover crewmembers thought lost - in this case the Doctor magically reappears inside the ship, having been apparently killed outside in the ruins of Atlantis. This story has a significant amount of the closing episode set inside the TARDIS and it affords excellent views of the new console (left). For the Tenth Anniversary story The Three Doctors, another new set was constructed which went before the cameras along with the existing console on 27th November 1972. 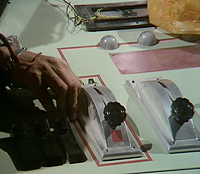 There was only one change to the console itself: A concealed signalling device was added which the Doctor used to call for the Time Lords, and this unit was simply a red pull-lever beneath a silver box-lid (pictured right). 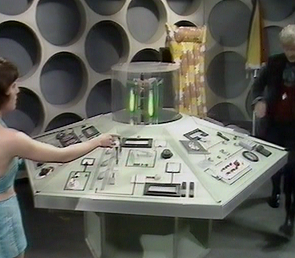 The next occasion which made use of the console was the end of Frontier in Space (actually a remount on 22nd January during Planet of the Daleks) in which the Doctor once again called for the Time Lords, but this time using the Telepathic Circuits that had formerly been seen as the Flight Indicator in The Sensorites (pictured left) albeit on the previous console. 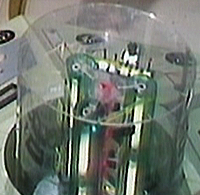 The prop was used again for a long sequence set inside the ship in Planet of the Daleks which revealed a number of new things about the main control room. The interior of the ship fell out of use again and the console wasn't brought back to the studio until four stories later, half way through the following season. A minor change was made to the prop, as usual because the script demanded it. Because Sarah asks 'Should that red light be flashing?' a conspicuous red light was added to where a similar set of controls had been (right). This was to be the only occasion that Elizabeth Sladen appeared in the TARDIS alongside Jon Pertwee and the interior of the programme's iconic vessel wouldn't be see again by viewers for nineteen months. This second console prop had been used in just over half-a-dozen stories before being seen for the last time in the dark, power-drained surroundings of the time machine in Death to the Daleks. After Jon Pertwee departed, so too did his console and when the control room finally returned a third TARDIS console prop was constructed for the new Doctor.